OSU hop prototype galvanized high trellis installation. Recently Brad R. Bergefurd, Extension Educator Agriculture and Natural Resources at The Ohio State University Extension Office of Scioto County gave a presentation to Portsmouth Rotary about Hops production in Ohio and a first in the world system he’s using. According to Bergefurd, Hops are a main ingredient in beer manufacturing, providing a bitterness that balances the sweetness of the malt sugars and a refreshing finish. Bergefurd, along with a team at The Ohio State University South Centers in Pike County have set up an area where they grow hops for research purposes and throughout the season, information is gathered that shared with other growers that may help them. Typically Bergefurd and his team will spend some time setting up a trellus system of guide wires and wooden poles, to allow for optimal hops growth. He said setting the poles and wires can be time intensive and at the end of the growing season, everything has to be taken down as stored. During the presentation Bergefurd said he’s working with a company in Indiana on a Galvanized Trellis System for growing hops and as far as he knows this system is the first of it’s kind in the world. “We’ve not been able to find a Galvanized Trellus System anywhere, as far as we know it’s the first Galvanized Trellus System in the world,” Bergefurd said. He said with a galvanized system the number of polls can be cut in half or further. Bergefurd said the Galvanized Trellus System eliminates the need for cables and guide wires and as a result growing areas could be bigger. The estimated cost of the Galvanized Trellus System and a traditional trellus system will be about the same, if not a bit cheaper. Because the Galvanized Trellus System is a first of it’s kind Bergefurd and his team will spend the next three years conducting research on the system located at the South Centers. “The neat thing is, we can build this (Galvanized Trellus System) a lot quicker and cut your labor that you need compared to wood in half. 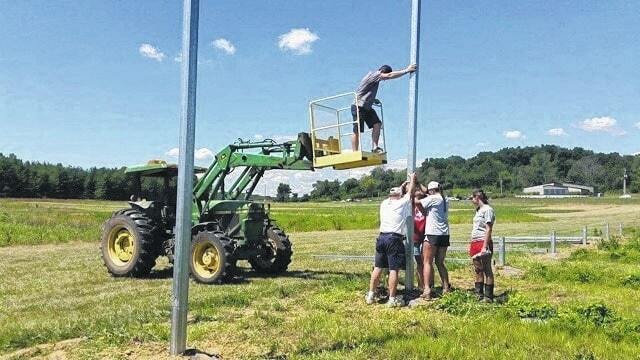 It took our crew half the time to put the Galvanized Trellus System up,” Bergefurd said. He said the initial research on the system seems positive and could mean a lot to a number of people growing hops. He said the work they are doing has already gotten the attention of hops farmers. “Stay tuned, we hope to have some good information out on that (Galvanized Trellus System) and research results within the next three years,” Bergefurd said. For more information about Hops or the Galvanized Trellus System at the OSU South Centers, there are first Friday Hop Yard Tours in Piketon and a variety of other programs and events email bergefurd.1@osu.edu. There are 170 Ohio breweries that produce an estimated 1.097 million barrels of craft beer annually, requiring an estimated four million pounds of hops at four pounds a barrel, worth an estimated $30 million. To meet current demands for hops an estimated 6,000 acres of hops are required. Ohio has an estimated 20 acres of hops planted since 2013.